The Romantic Times Booklovers Convention is quickly coming up and the hubby gave me the green light to go for two days. I’m so excited! I’ll be attending the conference on Friday and Saturday and I would love to see everyone else who is going. I know Angela from Dark Faerie Tales and Rayna from Naughty Editions will be there, but who else? With this in mind, I’ve dreamed up (literally) a feature that I’m hoping I’ll be able to run for the rest of the month. The “Look Who’s Going to RT” will showcase various authors (and bloggers!) who will be roaming the halls of the Columbus Hyatt. If you’re an author or blogger who would like to participate in this new feature, it’s a quick five questions that I’ll be using and they can be found here. 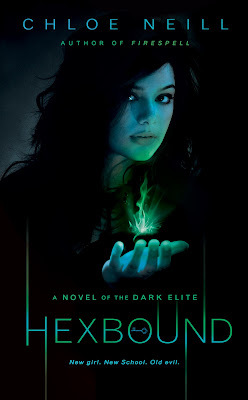 Chloe Neill unveiled the cover for the second Dark Elite novel, Hexbound, which is due out in January 2011. 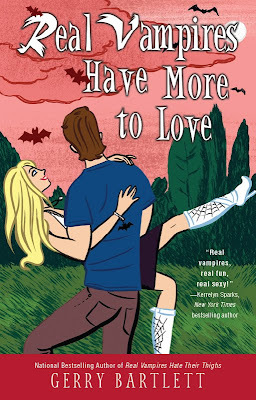 Jeaniene Frost will be interviewing her critique partner, Melissa Marr, tomorrow at 1pm at Romance Radio. If there’s something you ever wanted to know, you can call in with your questions during the interview at 347.826.9686 or via chat on Romance Radio. The Science Fiction and Fantasy Associated tweeted some great news today. Congratulations to SFWA member @Leannarenee. The Strangely Beautiful Tale of Miss Percy Parker will be adapted for musical theatre. Rachel Vincent has posted an excerpt for her upcoming novel My Soul To Keep, which releases June 1st. Joey w. Hill has posted the start to the latest Vampire Queen vignette. Taking the Gloves Off features Mason and Jessica from Beloved Vampire and may contain spoilers. Alpha Heroes is looking for review submissions for her stop of the Bookworms Carnival. Nicola will be featuring Arthurian Legends for her stop and will be accepting reviews or posts on the subject until May 7th. SciFiGuy has also found the cover for Mark del Franco’s Face Off, the second Laura Blackstone novel which will be released July 27, 2010. Oh good god….SciFi Wire is reporting that the latest book to get added to the “challenged books” list by the American Library Association is Stephenie Meyers Twilight saga. Why one might ask? Meyer’s stories of vampires and teen romance have been criticized for sexual content; a library association official also thinks that the “Twilight” series reflects general unease about supernatural stories. Seriously? Sexual content? What sexual content? I think Edward and Bella kiss once in each book and that’s it. Yeah, there’s the whole first love tension, but no content. Am I wrong? Rosemary Clement-Moore is having a massive contest to support Nothing but Nets Campaign. Contest ends April 29th. Jeri Smith-Ready is giving away a signed copy of Shade via her Facebook fan page. Contest ends April 16th. Calico Reader is giving away a copy of Maria Snyder’s Inside Out. Contest ends April 27th. All Things Urban Fantasy has posted her amazing list of contests that are going on in the blogosphere. Wicked Little Pixie is giving away a copy of Ardeur: 14 Writers on the Anita Blake, Vampire Hunter Series. Contest ends April 23rd. Gena Showalter is giving away a signed copy of Into the Dark. Contest ends soon. On the whole Twilight issue… I believe they are referring to scenes in Breaking Dawn. Cause the other books your right it’s just kissing. Have a fantastic time! I wish I could be there, so I can’t wait to read the full report from you and other bloggers fortunate enough to attend. when RT was here in orlando, Melissa Marr, Jeanine Frost, Rachael Vincent mark del franco and 1 other author came to my local borders and it was so cool, because we got to ask questions regarding the books and we they even signed books for us. I bought so many books and bought a whole new set of The night huntress series, just so she can sign them… it was so cool. i regret not going to the hotel, next time it comes to O-town i am going. have fun and take lots of pictures.